Maybe you’ve heard the internet meme-ish question: would you rather fight one horse-sized duck or a hundred duck-sized horses. Well, I’ve got a new one for you: would your rather own a kitty-cat sized-rhino or a rhino-sized kitty-cat? Because children of the 1980s were told that in the future they might just get such a choice. 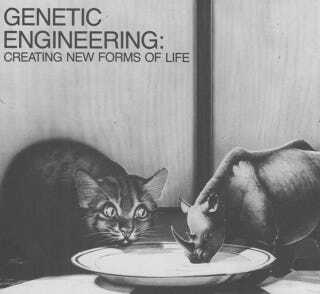 The 1982 book The Kids’ Whole Future Catalog imagined what the world of genetic engineering might mean to the people, plants and animals of the 21st century. The book presented genetic engineering as a natural progression in the course of human history, pointing out that people have been messing with plants and animals for thousands of years in an effort to produce more disease-resistant crops and heartier livestock. The book explains that until relatively recently “it has been possible to cross only species that are very similar. For instance, a mare and a donkey can be crossbred to get a mule, but the reproductive cells of a horse and a dog will not unite.” But apparently some time in the near future (when scientists finally get their act together), humans will know the majesty that is a horse/dog hybrid. In some ways, various aspects of this new genetically engineered future have arrived. However, the battle over whether this is a good thing is still being fought — and rather viciously at that. Anti-GMO activists argue that genetically modified crops are essentially setting up the public as guinea pigs for giant agribusiness companies which are peddling technologies that risk public safety, while pro-GMO scientists argue that there is broad consensus within the scientific community that genetically modified food is safe and entirely necessary in order to feed a planet where more and more mouths are arriving each day. • A Camato—a tomato plant with carrot roots. Plant combinations like this would make more efficient use of farmland. • A Plantimal — a combination of plant and animal cells which might someday provide a new kind of food. Plantimals would grow by photosynthesis like plants, changing light and chemicals into food. But they would taste like meat. • Oil-eating bacteria — tiny one-celled creatures which may someday help clean up oil spilled in the ocean. Other types of bacteria may extract valuable metals from mining wastes or from seawater. Still other “superbugs” may act as miniature factories, producing drugs, pesticides, and fertilizer. The book goes on to say that in the future scientists may acquire new knowledge which will “enable them to design forms of life which are very different from any we know today.” Well, it’s the future... so where’s my mini-rhino?